It seems like a simple request. All we want as customers is for an airline to take as much responsibility for our bags as FedEx would. We want to see our bags scanned everywhere so we can see where they are, and if they do get lost, we want to know when we will see them again. Like I said, simple . . . . Right. I had the chance to sit down with US Airways’ Managing Director of Customer Strategy Tim Lindeman and Director of Customer Strategy, Melody Anderson (yes, the customer strategy group needs a lot of “directing”) to talk about what US Airways is doing in the world of baggage. You might be surprised to know that it’s pretty cool. When you check your bag, the tag is scanned into the system and the bag is on its way. As of last November, your bag will now be scanned every time it gets on and off an airplane. So far, this is only implemented at domestic stations handled by mainline, but international stations should have scanners soon. Express stations don’t have them planeside yet but they have them in the baggage offices. What happens if your bag doesn’t follow you onboard? They’re currently working on notification capability. If your bag doesn’t make it on your flight, they will eventually be able to send you a text message letting you now. That way you’d skip the annoying part of waiting at the carousel for an hour before proceeding to the baggage service office (BSO). 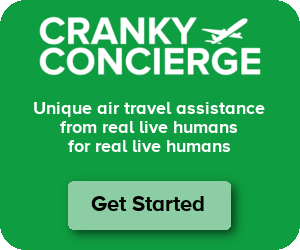 I suggested that they offer a notification that your bag IS on the plane as well – just for piece of mind – and they like that idea as well (maybe for a fee). Once your lost bag arrives in a BSO, it’s scanned so that they know where it is. When you get to the BSO, it may already be there waiting for you if it made it on an earlier flight. They’ll scan your bag claim tag and immediately be able to let you know where it is (or where it was last seen). I think we all know that reuniting with a lost bag isn’t always that easy. If a bag is left somewhere at the end of the day, the agents will open it up and choose a couple of unique items to enter into the claim. Now, with their new NetTracer system, someone will be able to search for those unique items and find their bag that way instead of saying “black rollerbag” like every other customer. What is this NetTracer system? In December, US Airways switched over from the old legacy WorldTracer system to the new, web-based NetTracer system for bag tracking purposes. The system actually came from the king of lost bags, The Owens Group. You may not know them, but they’re the ones that have the famed Unclaimed Baggage Center in Scottsboro, Alabama, the last place bags go after airlines have given up finding the owner. Apparently they decided to kill their own business by helping airlines stop losing so many bags. So far, airlines including AirTran and Spirit have adopted the system, but I believe US Airways is the first legacy carrier to do so. What’s so special about it? Search. The old system required looking through categories to try to match bags, but now you can simply search for your bag like you’d search on Google. You can type in info about your bag or info about the contents and that means there’s a better chance of finding your bag. It’s also a lot easier to teach to new agents since it’s web-based, and it’s more accurate since all the scanners automatically work with the system. Not more typing in wrong numbers. My first question was . . . doesn’t scanning each bag manually take a lot of time? The answer is surprisingly no. They said that during all their tests, it didn’t appreciably increase the amount of time required to handle bags. There are also a lot of benefits from this system that speed things up. For example, those loading the bags will eventually be able to automatically have weight and balance calculated and sent to the aircraft so they don’t have to run up and down stairs. Recently (assuming the planned release happened in April), they added some even more helpful improvements. On widebody aircraft, bags aren’t just thrown in the holds down below but rather put in containers first and those containers are loaded on the airplane. If someone doesn’t get on the plane and the airline has to pull that person’s bag, it can be very time-consuming. Now, the bags and containers will all be scanned, so when someone’s bag needs to be pulled off, it can easily be located instantly. US Airways will also get a real-time baggage matrix that will show how many bags still need to be loaded on airplanes waiting to depart and from which flights they’re coming. That way they can easily pay attention to those airplanes that have a lot of bags on tight connections to help get them on the plane before it departs. Apparently United and Northwest do scan their bags as well, and others, like Continental are working on it. I’m not, however, sure how far their plans will take them. In the end, this is a great thing for customers. Bags will be more easily tracked, and when they’re separated from the customer, it will be easier to give accurate estimates of when the bags will arrive. There should be no more “well, it’s probably on the next flight” types of conversations. Ultimately, they admitted that with these new systems, there’s a lot that they can do. So this is just the start, and it should result in good news for customers. United has been scanning across the domestic system since at least 2004. A lot of what US is doing is already in place there, including matching containers for widebodies. In the baggage sorting rooms below the ticket counter workers are assigned specific flights. They check-out up to three scanners from the battery charging station, enter the flight number and what type of bag each scanner will record (locals, interline and express on one, internationals on the 2nd and online connections on the 3rd, for example). As the bags come down the belt they take the bag to the cart designated for the destination on the tag, scan the barcode, stack the bag and head back to the belt for the next bag. Simple and quick. The guys on the ramp decide which cargo pit will receive which type of luggage based on the volume from the bagroom. The weights are already calculated so load planning only needs to know where it is on the plane for balance. Pulling a bag off a flight is theoretically easier on a widebody in knowing which “can” the bag is in. As with all things, even on narrowbodies, it depends on how far in to the plane that can is buried but it does save having to manually handle up to 200 bags to find it. Any “ramp rat” will tell you it never fails – the one you’re looking for is the one at the far end of the pit up against the firewall! All positive developments in bag tracking (I like the SMS notification idea), but as a frequent biz traveler I decided years ago to never check a bag. By packing smart, I can pack for a week in a standard rollaboard bag. It’s great to be one of the first pax out to ground transport when I don’t have to waste 30 minutes in baggage claim. I think it’s time to design and implement RFID (Radio Frequency Identification) system for luggage tracking. It will reduce Barcode tag printing (the cost of an RFID tag for the luggage is not high if we consider that a industry wide system integration, may allow the tag to be used multiple times). Luggage can be tracked even when in the belly of the airplane. Less operational costs because of less manual scans and sorting procedures. Less luggage thefts, an RFID perimeter can be set, and system wide alarms can be activated when an active tag in the system is not at the place it should be. And these are only a few of the benefits. The technology is already there, a good planning and understanding of this kind of technology, plus an industry wide coordination, can in my opinion, reduce luggage handling issues to a fraction of today’s numbers, even off-seting some of the costs that the industry pays today. HG Estella Lee – I actually asked them about RFID and they said it’s still too expensive. This has definitely been hanging out there for years, so hopefully it will eventually be cheap enough. Yes, but will they refund my $15 when they lose my bag? May be is wise to wait to see what Wal-Mart does, the design foundation and system analysis results of the solution are similar to what I think the airline industry should do, but yet I don’t think (IMHO) that they (airlines/Port authorities/airport administrators) have done a thorough cost/benefits analysis. I’m about to display some ignorance in this technology. a) TSA flips out on any bag emitting any signal, beeping or vibrating from the inside. Is it a remote detonation device, an alarm clock going off or simply a razor switched on by accident? b) We get nagged to turn off iPods and other “soft signal” devices for take-off and landing. Now we have a cargo hold full of blips going off at all times sending out tracking signals? c) From a security perspective how can RFID be shielded against any attempt to use it as a homing signal or radio assisted assualt or as a timing device for internal detonation. In short, how to prevent the RFID from being “morphed/warped” in to something dangerous. If all of these have been addressed, I thank you for bringing me up to speed. RFID chips are passive, and don’t broadcast a signal unless they’re activated by a reader — and even then, it’s short-range and relatively weak. You can shield them, but that would defeat the point. I wouldn’t see the mere presence of RFID chipware in baggage tags as a threat per se, but it’s something that should definitely be thought about rationally (well, that’s something that eludes the TSA) in any attempt to bring RFID bag-tracking to the market. Traveling Optimist – Your concerns have been addressed by the designs of the system. The RFIDs that are generally thought of are passive RFIDs — they aren’t powered on their own, they only transmit when they get the energy to do so from the RFID reader, so if there isn’t a reader nearby they’re just some metal inside of paper..
Additionally their transmission range is usually 40-50 feet, which makes them not useful for tracking an airplane, besides most planes are already transmitting most of the time. Why are they charging $15? I think that should be included in the ticket price already. A chip, waiting on a signal, to activate and transmit it’s location? Why does that creep me the EFF out? Cargo holds on the stretch widebodies can exceed 40-50 feet, the range of the RFID signal. “Shooting” the signal to find a bag stacked in a container at the very far end of the compartment would not be an easy thing to do based on current strengths. That says nothing about freaking people out who may happen to see someone pointing something at an airplane that has the same shape and proportions of a fire arm. I will read the article recommended by Estella and I’m sure these issues have at least been discussed. Thanks everyone. Wasn’t/isn’et there a Russian made airplane where passengers walked from the terminal to the plane and used stairs to board via the cargo section and placed their own bags on the plane then went up internal stairs to the cabin? That would be one way to make sure you bags went on the plane. Sorry your Macbook went missing. Unfortunately baggage handlers are probably the least trustworthy workers on the tarmac, and there’s not much one can do to monitor them (“who will watch the watchers?”). Best that can be done is to run criminal background checks before they are hired. Tip for you: never put a laptop into checked baggage, always keep it with you. Typical of USAirways… a fee for everything. How about just taking care of us when we buy a ticket? Unfortunately, I can not pack carry on as most of my trips are international and tend to last 10 days or more. Plus when it is summer here, it is winter on the other side of the equator making packing a challenge. But then the same thing happened at BCN, again with 2 hours of connecting time. Luckily, in both cases, the concierge of the respective hotels I stayed at dealt with the airlines and the luggage came back. I am however the proud owner of several new shirts and more new underwear and socks bought in the span of week then I would normally buy in a year (yes, there were weekends involved). What was interesting was that at both airports I had checked the status of my bags with the gate agent, handing them the luggage tags. Both agents told me that my bags were on board. Obviously a blatant lie so that they did not have to deal with a disappointed/annoyed passenger. Having learned the from the first lie (Air France @ CDG), on the BCN – BRU flight I then double checked with the flight attendant (Brussels Airlines) and she told me that the bags were NOT on board. I told her what the gate agent had told me (having asked him twice, and recounting the experience at CDG). The flight attendant was not prepared to agree that the gate agent had lied, saying that generally nobody knows for sure if a bag is on the plane or not… Hardly believable, but her words verbatim! And @ Jan O: as far as I know, you can no longer lock your luggage as the TSA reserves the right to open them at any time. They will break the locks, or your luggage, to inspect if they feel like it and you have no right to claim damages. Locks on luggage also is a clear indication that there is stuff of value inside. In your case I think it is clearly theft. But I have stopped using fancy suitcases and travel with a battered, unlocked suitcase and all my (electronic) valuables come with me as carry on. Jan O – The best I can tell you is that you really shouldn’t check a computer at all. There are exemptions in the liability for high value items, so you’re out of luck, sadly. Always carry your most valuable possessions on the plane if they aren’t too big. DavidSFeastbay – Yep, the IL-86 had you board from down below, but I think you only dropped off your coats and carry on’s. Maybe I’m wrong, but I wouldn’t want passengers loading their bags for weight and balance purposes. Cranky is correct. The IL-86 was designed with ground level stairs for passengers to board and store carry-ons, similar to how RJs handle it today. Only the IL-86 is a 4-engine clone of the Airbus A300 in size! Why the weird set-up? Because it was designed to operate to remote/primitive Siberian fields above the Arctic Circle where jetbridges generally don’t exist and probably much of the ground equipment too dilapidated to work in freezing conditions. The Traveling Optimist – RFIDs aren’t transmitting their location per se, they’re just transmitting the information. Now I’m sure you could do some triangulation to figure out where the tag is located..
As for the problems locating a bag with RFIDs on a widebody, I’d assume bags are assigned into a specific container, then the location of that container on the plane is specified. Yes, you are correct. All things normal, with scanning, airlines know which containers contain which luggage. Without scanning, notice each bag tag number is repeated on small quarter inch strips at the bottom of the tag. One of those strips is supposed to be pulled and affixed to a paper manifest which is filed with the load office of the originating airport in case a bag needs to be pulled. Regarding RFID and baggage, it’s already being done: http://www.rfidjournal.com/article/view/4608. United has been running a test program out of Chicago with RFID bag tags. Rampers, as I am one are not untrustworthy people. Based on flights I work, the quick turns and sheer amount of bags makes it impossible for a ramp person to open and root through a bag. TSA on the otherhand will break locks or the actual zippers, then if they don’t decide to take something, it will fall out during it’s transit to where it has to go. I did have a camera fall out of a bag unloading it from the plane, I spotted where the zipper was busted, put the camera in and got a supervisor to put some tape around it so it would be secure. Please don’t jump to conlusions Derek, Jan O, most laptops weigh around 4 lbs. Most purses I’ve seen women carrying look like they weigh 10+. Please be careful and remember to be safe and not pack something of extreme value in luggage as Rampers are not the only ones who come across your bags. Thanks. Cranky – I can’t remember having to drop bags off as I boarded one of several IL-86’s on a memorable (for the wrong reasons) trip to India. What I DO remember was there being cow sh1t on the carpet of the plane, and when we took off from DME for a supposedly (but not) non-stop flight to DEL the plane was rotating and there were still 10 passengers walking around looking for seats. Not all of them found one! Oh, man, tell the WHOLE story, willya? If ever there was an adventure in the air your story of an IL-86 from DME to DEL sounds like a winner! What was the occasion and cause of the trip? How did the plane fly? Noisy? Smooth? Share, man, share! I’ve tried to erase it from my memory, such was the degree of psychological scarring! So, this was a ‘cheap’ Christmas holiday to India, and Aeroflot were the cheapest (at the time). We left 9 hours late from LHR on a dirty but huge IL-86 – the staircase was impressive though! Flight was uneventful, but we landed in about a foot of snow at DME, and the landing was utterly perfect. Immigration was dodgy. DME was dodgy (this was 3 weeks before the collapse of the Soviet Union), and we left for DEL a couple of hours late. Then followed the episode with walking passengers and a plane mid-take-off – we had no seat assignments, it was just a free-for-all. The flight was supposed to be about 8 hours to DEL, but I was somewhat surprised when we starting descending after 5h, and eventually landed in Tashkent. Nice. Actually, the airfield (which was huge) was an incredible site, stuffed full of (I reckon) a quarter of the Aeroflot fleet, in pieces in the out field. Somewhat reminiscent of downtown Detroit, actually, but with more aeroplanes. Turns out that Aeroflot had insufficient funds to pay for fuel in Moscow, hence it was cheaper to fill up in Uzbekistan. Finally landed some 8 hours late in DEL. The return journey was rather more dodgy. We’d spent the previous week in New Delhi trying to get our tickets endorsed so that we could move to another airline! Some b@stard in Goa told me he got direct flights with Thai International for £50 cheaper than we’d paid for Aeroflot – git. Anyway, we already knew to expect a stop in Tashkent on the way back (although this wasn’t mentioned at check-in or on the itinerary). First bummer was having a guy sit next to me who had to be carried onto the plane, having already downed a full bottle of whiskey. That was nice. Then, 3hrs into the flight there was a very large bang, followed by a rapid descent (reckon probably only 100 – 200ft) and rapid ascent, which was actually quite amusing as the cabin was just a sea of turbans flying in the air! No announcements from the flightdeck for 30 mins, then something in Russian, then a muttered apology in English which lasted 3 words! We landed safely at TAS, got back on the IL-86 and arrived safely in DME. Then followed a 20h(!!) layover. In the airport. With no currency. Aeroflot had laid on food (red cabbage soup) but it was sold on the black market to people coming into the airport from the City before we got it. Finally took a nice flight back to LHR in a Tu-154, again to arrive very, very late. I was a nervous flier for the next 5 years. I then became a realist! Anyway, Happy Days! One small correction, I think. You would have been lucky to fly into DME, but I don’t think there was much there that long ago. You were probably stuck in SVO, a far worse place to be. That can only help your story get more frightening. . . Truly an amazing story, mate. Hopefully the time in Goa was worth the experience! My bad, mate, it was SVO! Goa is always worth it! In fact, India is always worth it. I’m amazed they are STILL testing RFID in bag tags. We participated in a RFID test with bag tags at least 6 years ago. This was in JFK. At that time, it was very expensive to produce the RFID tag, and the RFID bag tag printer was at least $5K. I’m can’t seem to remember the stats from that test, but I recall there were a lot fewer ‘misreads’ on the belt, so they felt the number of readers on the belt system could be reduced. Right now the bar code scanners are all over the place to try to read bar codes on tags that are positioned in every conceivable position on a bag handle by harried agents. In the ‘load your own bags’ category..I saw a short blurb the other day that Ryan Air is considering having passengers board their own bags. Just as with all jobs there are people that are good and people that aren’t. My husband has worked for a major airline on the ramp for 25 years and he doesn’t steal. I resent the comment that you would lump them all together. By the time a bag has made it to the airplane it has gone through so many hands anyone could take from it. The best rule is to never check medicines, anything of value or that you can’t replace if your bag is lost. Oh, and stay away from people that make idiotic comments. I travel all over the Northwest. What a cluster! If I could avoid bag checking I would. Bags have been lost at least three times. When are they going to implement this RFID technology? No way am I checking my laptop through. Don’t trust their current system. I’m desperate – still without my bag. I travelled with US Airways Miami-Philadelphia-LHR on 3/4 January. My bag did not arrive with me. Was told it was scanned in Miami but after that I have had various stories that it came with KLM the next day to LHR, that it arrived in Amsterdam and then came to LHR with BMI. I have original tag number and also ‘rush’ tag but US Airways can’t tell me where it is. Very unsatisfactory and nothing at all from airline, only a claim form. Any ideas? That’s not good, that’s for sure. I would just keep calling US Airways on a daily basis. If you’re back in Miami, you could even just go to the airport and ask someone at the baggage service office. They won’t have any better information, but they’ll probably be more willing to spend time helping you (if you go when they aren’t busy). Keep us posted.